The dollar amount of your maximum annual contribution depends on a number of factors. Your status in regard to these three factors almost entirely determines the extent of your Roth IRA contribution limitations. First of all, if you have no earned income (as determined by the Roth IRA income rules), then your Roth IRA contribution limit is zero. And your annual Roth IRA contribution can not exceed your annual earned income. That said, even these dollar amounts are subject to annual income limits. Your Roth IRA contribution limit is ultimately determined by the amount of earned income you have. $127,000 for individuals who file as single, head of household, or married filing separately. Unfortunately, if your earned income exceeds these thresholds, you can NOT make a Roth IRA contribution. Depending on your IRS tax filing status, the amount of your maximum annual contribution can vary significantly. If your earned income is between $178,001 and $188,000, your maximum contribution amount is gradually phased out to zero. If your earned income is between $112,001 and $127,000, your Roth IRA contribution limit is gradually phased out to zero. If your earned income is between $1 and $10,000, then your maximum contribution amount is gradually phased out to zero. If your income is in the range where your contribution phases out to zero, then you need to consult with your accountant in order to determine the exact amount of your Roth IRA contribution limit. As a general rule, your maximum annual Roth IRA contribution limit is calculated as a percentage of the IRS maximum contribution limit based on where your income falls within the ranges outlined above. For instance, let's say you're married filing jointly with a combined income of $183,000. Since $174,000 falls precisely in the middle of the $178,000 to $188,000 phase out range, then your maximum Roth IRA contribution is equal to 50% of the maximum contribution for your age bracket. So if you're under age 50, your maximum contribution is $2,750. If you're 50 or older, it's $3,250. If not, see Roth IRA Phase Out to learn more about calculating your contribution limit. You may qualify to contribute up to $8,000 if you participated in a 401(k) plan maintained by an employer who went into bankruptcy in an earlier year. If you think you qualify for this exemption to the maximum contribution amount, consult with your accountant to see exactly where you stand. 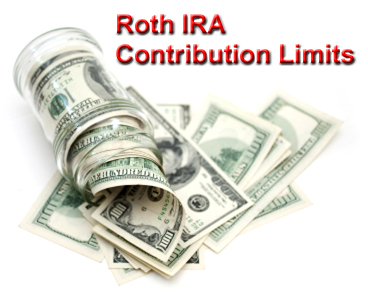 Over time, the IRS tends to increase the maximum annual contribution for Roth IRAs. Historical Roth IRA contribution limits indicate a gradual, incremental increase in the maximum annual contribution for individuals of all ages. So keep in mind that, in all likelihood, you'll be able to contribute more money to your Roth IRA over time. What are the 2013 contribution limits? Is it true that income limits for making a Roth IRA contribution disappeared in 2010, or is that just a myth? Knowing the truth about changes to the 2013 tax laws governing your Roth IRA can save you thousands of dollars and countless of hours of unnecessary aggravation. So take the time to learn the 2013 contribution rules. What are the 2014 contribution limits? If you've already made the maximum contribution for the 2013 tax year, it's never too early to start looking ahead to next year.